Though St. Antony be justly esteemed the institutor of the cenobitic life, or that of religious persons living in community under a certain rule, St. Pachomius was the first who drew up a monastic rule in writing. He was born in Upper Thebais about the year 292, of idolatrous parents, and was educated in their blind superstition, and in the study of the Egyptian sciences. From his infancy, he was meek and modest, and had an aversion to the profane ceremonies used by the infidels in the worship of their idols. Being about twenty years of age, he was pressed into the emperor's troops, probably the tyrant Maximinus, who was master of Egypt from the year 310; and in 312 made great levies to carry on a war against Licinius and Constantine. He was, with several other recruits, put on board a vessel that was falling down the river. They arrived in the evening at Thebes, or Diospolis, the capital of Thebais, a city in which dwelt many Christians. Those true disciples of Christ sought every opportunity of relieving and comforting all that were in distress, and were moved with compassion towards the recruits, who were kept close confined, and very ill-treated. The Christians of this city showed them the same tenderness as if they had been their own children; took all possible care of them, and supplied them liberally with money and necessaries. Such an uncommon example of disinterested virtue made a great impression on the mind of Pachomius. He inquired who their pious benefactors were, and when he heard that they believed in Jesus Christ the only Son of God, and that in the hope of a reward in the world to come, they labored continually to do good to all mankind, he found kindled in his heart a great love of so holy a law, and an ardent desire of serving the God whom these good men adored. The next day, when he was continuing his journey down the river, the remembrance of this purpose strengthened him to resist a carnal temptation. From his infancy he had been always a lover of chastity and temperance but the example of the Christians had made those virtues appear to him far more amiable, and in a new light. After the overthrow of Maximinus, his forces were disbanded. Pachomius was no sooner returned home, but he repaired to a town in Thebais, in which there was a Christian church, and there he entered his name among the catechumens, or such as were preparing for baptism; and having gone through the usual course of preliminary instructions and practices with great attention and fervor, he received that sacrament at Chenoboscium, with great sentiments of piety and devotion. From his first acquaintance with our holy faith at Thebes, he had always made this his prayer: "O God, Creator of heaven and earth, cast on me an eye of pity: deliver me from my miseries: teach me the true way of pleasing you, and it shall be the whole employment, and most earnest study of my life to serve you, and to do your will." The perfect sacrifice of his heart to God, was the beginning of his eminent virtue. The grace by which God reigns in a soul, is a treasure infinitely above all price. We must give all to purchase it. To desire it faintly is to undervalue it. He is absolutely disqualified and unfit for so great a blessing, and unworthy ever to receive it, who seeks it by halves, or who does not esteem all other things as dung that he may gain Christ. When Pachomius was baptized, he began seriously to consider with himself how he should most faithfully fulfil the obligations which he had contracted, and attain to the great end to which he aspired. There is danger even in fervor itself. It is often an artifice of the devil to make a novice undertake too much at first, and run indiscreetly beyond his strength. If the sails gather too much wind, the vessel is driven ahead, falls on some rock and splits. Eagerness is a symptom of secret passion, not of true virtue, where it is wilful and impatient at advice. Pachomius was far from so dangerous a disposition, because his desire was pure, therefore his first care was to find a skilful conductor. Hearing that a venerable old man named Palemon, served God in the desert in great perfection, he sought him out, and with great earnestness begged to live under his direction. The hermit having set before him the difficulties and austerities of his way of life, which several had already attempted in vain to follow, advised him to make a trial of his strength and fervor in some monastery; and, to give him a sketch of the difficulties he had to encounter in the life he aspired to, he added: "Consider, my son, that my diet is only bread and salt: I drink no wine, use no oil, watch one half of the night, spending that time in singing psalms or in meditating on the holy scriptures, and sometimes pass the whole night without sleeping." Pachomius was amazed at this account, but not discouraged. He thought himself able to undertake every thing that might be a means to render his soul pleasing to God, and readily promised to observe whatever Palemon should think fit to enjoin him; who thereupon admitted him into his cell, and gave him the monastic habit. Pachomius was by his example enabled to bear solitude, and an acquaintance with himself. They sometimes repeated together the psalter, at other times they exercised themselves in manual labors (which they accompanied with interior prayer,) with a view to their own subsistence and the relief of the poor. Pachomius prayed above all things, for perfect purity of heart, that being disengaged from all secret attachment to creatures, he might love God with all his affections. And to destroy the very roots of all inordinate passions, it was his first study to obtain the most profound humility, and perfect patience and meekness. He prayed often with his arms stretched out in the form of a cross; which posture was then much used in the church. He was in the beginning often drowsy at the night office. Palemon used to rouse him, and say: "Labor and watch, my dear Pachomius, lest the enemy overthrow you and ruin all your endeavors." Against this weakness and temptation he enjoined him, on such occasions, to carry sand from one place to another, till his drowsiness was overcome. By this means the novice strengthened himself in the habit of watching. Whatever instructions he read or heard, he immediately endeavored fervently to reduce to practice. One Easter-day Palemon bade the disciple prepare a dinner for that great festival. Pachomius took a little oil, and mixed it with the salt, which he pounded small, and added a few wild herbs, which they were to eat with their bread. The holy old man having made his prayer, came to table; but at the sight of the oil he struck himself on the forehead, and said, with tears: "My Saviour was crucified, and shall I indulge myself so far as to eat oil?" Nor could he be prevailed upon to taste it. Pachomius used sometimes to go into a vast uninhabited desert, on the banks of the Nile, called Tabenna, in the diocese of Tentyra, a city between the Great and Little Diospolis. While he was there one day in prayer, he heard a voice which commanded him to build a monastery in that place, in which he should receive those who should be sent by God to serve him faithfully. He received, about the same time, from an angel who appeared to him, certain instructions relating to a monastic life.. Pachomius going back to Palemon, imparted to him this vision; and both of them coming to Tabenna, built there a little cell towards the year 325, about twenty years after St. Antony had founded his first monastery. After a short time, Palemon returned to his former dwelling, having promised his disciple a yearly visit, but he died soon after, and is honored in the Roman Martyrology on the 11th of January. Pachomius received first his own eldest brother John, and after his death many others, so that he enlarged his house; and the number of his monks in a short time amounted to a hundred. Their clothing was of rough linen; that of St. Pachomius himself often haircloth. He passed fifteen years without ever lying down, taking his short rest sitting on a stone. He even grudged himself the least time which he allowed to necessary sleep, because he wished he could have been able to employ all his moments in the actual exercises of divine love. From the time of his conversion he never ate a full meal. By his rule, the fasts and tasks of work were proportioned to every one's strength; though all are together in one common refectory, in silence, with their cowl or hood drawn over their heads, that they might not see one another at their meals. Their habit was a tunic of white linen without sleeves, with a cowl of the same stuff; they wore on their shoulders a white goatskin, called a Melotes. They received the holy communion on the first and last days of every week. Novices were tried with great severity before they were admitted to the habit, the taking of which was then deemed the monastic profession, and attended with the vows. St. Pachomius preferred none of his monks to holy orders, and his monasteries were often served by priests from abroad, though he admitted priests, when any presented themselves, to the habit, and he employed them in the functions of their ministry. All his monks were occupied in various kinds of manual labor: no moment was allowed for idleness. The saint, with the greatest care, comforted and served the sick himself. Silence was so strictly observed at Tabenna, that a monk, who wanted any thing necessary, was only to ask for it by signs. In going from one place to another, the monks were ordered always to meditate on some passage of the holy scripture, and sing psalms at their work. The sacrifice of the mass was offered for every monk that died, as we read in the life of St. Pachomius. His rule was translated into Latin by St. Jerome, and is still extant. He received the sickly and weak, rejecting none for the want of corporal strength, being desirous to conduct to heaven all souls which had fervor to walk in the paths of perfection. He built six other monasteries in Thebias, not far asunder, and from the year 336, chose often to reside in that of Pabau, or Pau, near Thebes, in its territory, though not far from Tabenna, situated in the neighboring province of Diospolis, also in Thebais. Pabau became a more numerous and more famous monastery than Tabenna itself. By the advice of Serapion, bishop of Tentyra, he built a church in a village for the benefit of the poor shepherds, in which for some time he performed the office of Lector, reading to the people the word of God with admirable fervor; in which function he appeared rather like an angel than a man. He converted many infidels, and zealously opposed the Arians, but could never be induced by his bishop to receive the holy order of priesthood. In 333, he was favored with a visit of St. Athanasius at Tabenna. His sister, at a certain time, came to his monastery desiring to see him; but he sent her word at the gate, that no woman could be allowed to enter his enclosure, and that she ought to be satisfied with hearing that he was alive. However, it being her desire to embrace a religious state, he built her a nunnery on the other side of the Nile, which was soon filled with holy virgins. St. Pachomius going one day to Pane, one of his monasteries, met the funeral procession of a tepid monk deceased. Knowing the wretched state in which he died and to strike a terror into the slothful, he forbade his monks to proceed in singing psalms, and ordered the clothes which covered the corpse to be burnt, saying: "Honors could only increase his torments; but the ignominy with which his body was treated, might move God to show more mercy to his soul; for God forgives some sins not only in this world, but also in the next." When the procurator of the house had sold the mats at market at a higher price than the saint had bid him, he ordered him to carry back the money to the buyers, and chastised him for his avarice. Among many miracles wrought by him, the author of his life assures us, that though he had never learned the Greek or Latin tongues, he sometimes miraculously spoke them; he cured the sick and persons possessed by devils with blessed oil. But he often told sick or distressed persons, that their sickness or affliction was an effect of the divine goodness in their behalf; and he only prayed for their temporal comfort, with this clause or condition, if it should not prove hurtful to their souls. His dearest disciple, St. Theodorus, who after his death succeeded him in the government of his monasteries, was afflicted with a perpetual headache. 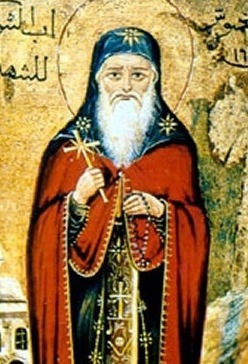 St. Pachomius, when desired by some of the brethren to pray for his health, answered: "Though abstinence and prayer be of great merit, yet sickness, suffered with patience, is of much greater." He chiefly begged of God the spiritual health of the souls of his disciples and others, and took every opportunity to curb and heal their passions, especially that of pride. One day a certain monk having doubled his diligence at work, and made two mats instead of one, set them where St. Pachomius might see them. The saint perceiving the snare, said, "This brother hath taken a great deal of pains from morning till night, to give his work to the devil." And, to cure his vanity by humiliations, he enjoined him, by way of penance, to keep his cell fire months, with no other allowance than a little bread, salt, and water. A young man named Sylvanus; who had been an actor on the stage, entered the monastery of St. Pachomius with the view of doing penance, but led for some time an undisciplined life, often transgressing the rules of the house, and still fond of entertaining himself and others with buffooneries. The man of God endeavored to make him sensible of his danger by charitable remonstrances, and also employed his more potent arms of prayer, sighs, and tears, for his poor soul. Though for some time he found his endeavors fruitless, he did not desist on that account; and having one day represented to this impenitent sinner, in a very pathetic manner, the dreadful judgments which threaten those that mock God, the divine grace touching the heart of Sylvanus, he from that moment began, to lead a life of great edification to the rest of the brethren; and being moved with the most feeling sentiments of compunction, he never failed, wheresoever he was, and howsoever employed, to bewail with bitterness his past misdemeanors. When others entreated him to moderate the floods of his tears, "Ah," said he, "how can I help weeping, when I consider the wretchedness of my past life, and that by my sloth I have profaned what was most sacred? I have reason to fear lest the earth should open under my feet, and swallow me up, as it did Dathan and Abiron. Oh! suffer me to labor with ever-flowing fountains of tears, to expiate my innumerable sins. I ought, if I could, even to pour forth this wretched soul of mine in mourning; it would be all too little for my offences." In these sentiments of contrition he made so "real progress in virtue, that the holy abbot proposed him as a model of humility to the rest; and when, after eight years spent in this penitential course, God had called him to himself by a holy death, St. Pachomius was assured by a revelation, that his soul was presented by angels a most agreeable sacrifice to Christ. The saint was favored with a spirit of prophecy, and with great grief foretold the decay of monastic fervor in his order in succeeding ages. In 348 he was cited before a council of bishops at Latopolis, to answer certain matters laid to his charge. He justified himself against the calumniators, but in such a manner that the whole council admired his extraordinary humility. The same year, God afflicted his monasteries with a pestilence, which swept off a hundred monks. The saint himself fell sick, and during forty days suffered a painful distemper with incredible patience and cheerfulness, discovering a great interior joy at the approach of the end of his earthly pilgrimage. In his last moments he exhorted his monks to fervor, and having armed himself with the sign of the cross, resigned his happy soul into the hands of his Creator in the fifty-seventh year of his age. He lived to see in his different monasteries seven thousand monks. His order subsisted in the cast till the eleventh century: for Anselm, bishop of Havelburgh, writes, that he saw five hundred monks of this institute in a monastery at Constantinople. St. Pachomius formed his disciples to so eminent a degree of perfection chiefly by his own fervent spirit and example; for he always appeared the first, the most exact, and the most fervent, in all the exercises of the community. To the fervor and watchfulness of the superior it was owing that in so numerous a community discipline was observed with astonishing regularity, as Palladius and Cassian observe. The former says that they ate with their cowl drawn so as to hide the greatest part of their faces, and with their eyes cast down, never looking at one another. Many contented themselves with taking a very few mouthfuls of bread and oil, or of such like dish; others of pottage only. So great was the silence that reigned among them while every one followed his employment, that in the midst of so great a multitude; a person seemed to be in a solitude. Cassian tells us, that the more numerous the monastery was, the more perfect and rigorous was regular observance of discipline, and all constantly obeyed their superior more readily than a single person is found to do in other places. Nothing so much weakens the fervor of inferiors as the example of a superior who easily allows himself exemptions or dispensations in the rule. The relaxation of monastic discipline is often owing to no other cause.